ProEnc projector enclosures for outdoor use. 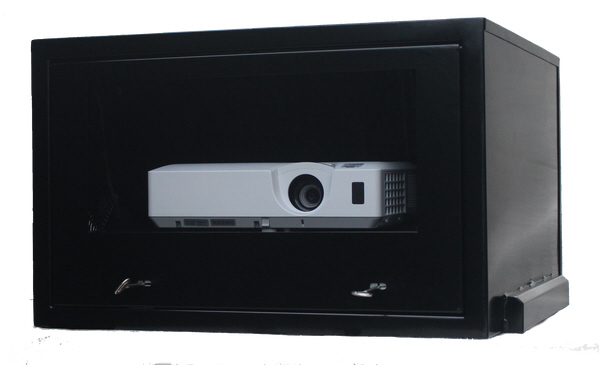 Here at ProEnc Limited we have designed and developed protective outdoor projector cases, to safeguard projectors outdoors. Our units are designed for extreme temperatures also providing weatherproofing, security as well as having vandal resistant properties for the hardware used in outdoor cinemas and digital signage. This unit has taken 6 months to develop and has been tested in locations and temperatures that you would think insane for outdoor projector deployment, working in temperatures from -4F to 145F! Our projector enclosure comes as standard with a sophisticated heated and cooling system that is thermostatically controlled, making sure the hardware inside remains at a constant, ambient temperature inside. The company is owned and led by an engineer, who has himself in excess of 25 years manufacturing protective electronic housings for various types of hardware. The outdoor projector enclosure is made of steel and is one of the only units on the market to be fitted with high security, vandal resistant locks. This is essential, when you are installing a projector in a remote location, or unmanned area. One solution that is occasionally overlooked, is the air inlet; ours is fitted with washable filters, preventing any dust, dirt or insects entering the protective housing and damaging the hardware within. Locations that use outdoor projector enclosures. This protective housing, provides the essential protection from snow, rain and hail and even sand. Made from heavy gauge sheet metal, welded for the ultimate in strength then coated in an epoxy powder coating in black to reflect the sun. Check out our discount coupon pages, so you always get the best priced deal for the most secure outdoor enclosures for projectors on the market. We also offer an expedited service, just in case you need the protective outdoor housing in a rush. Contact ProEnc for your protective, outdoor projector enclosures, toll free on 1-862-234-5981.